This week is National School Lunch Week. President John F. Kennedy created it in 1962 to promote the benefits of healthy school lunches and to recognize the important impact they make in a child’s life. The National School Lunch Program (NSLP), which was signed into law in 1946, is the largest of the federal child nutrition programs. It ensures that all students, regardless of income level, are provided with lunches that follow strict federal nutrition standards. Every school lunch contains servings of fruits and vegetables, whole grains, lean protein and low-fat dairy. 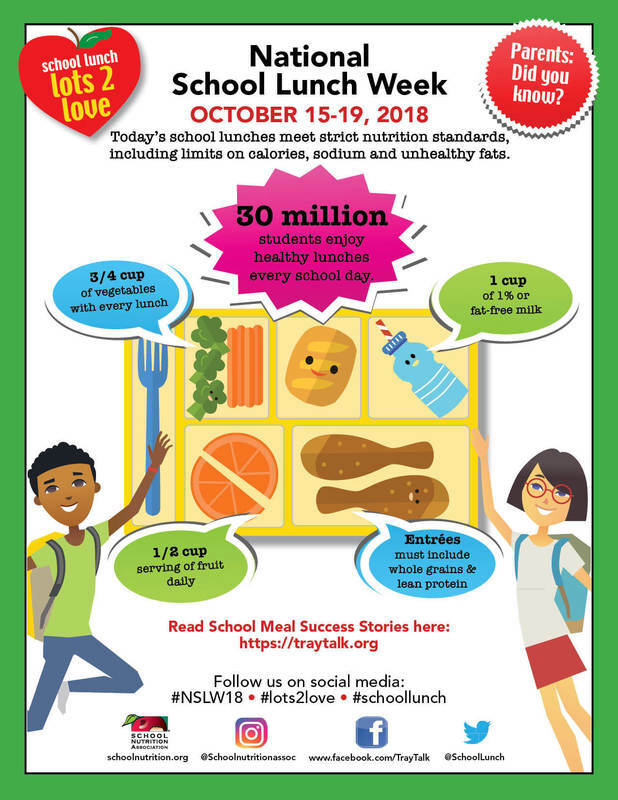 Today, 95% of U.S. elementary and secondary school students (30 million students) are enrolled in schools that participate in the NSLP and are provided each school day with healthy school lunches. This week, take the opportunity to thank the food service professionals in your school to show appreciation for the important service they provide each day.